I am in love my friends. Not just with hot, hunky Christian, not just with Victoria's beautifully broken story, not even just with the amazing writing in this book, but honestly with the whole package. It has been a long time since a paranormal book has really taken my breath away. So long in fact, that I thought I was done with the concept of vampires, witches and the like. Bloodspell has officially changed my mind, and I'm smitten. Let me start with the characters. For those of you out there who simply must fall in love with your characters in order to enjoy a book, welcome to your Eden. Victoria and Christian are gorgeously written, and perfectly flawed. See, there is no set line drawn between the "good" and "bad" sides of what the two of them are. Amalie Howard shows the inner battle of emotions that goes on in each of them. The all-consuming need to give in to their baser instincts. They make mistakes. They let the darkness within them take over at times. It's this flawed existence that makes them so amazing and so believable. 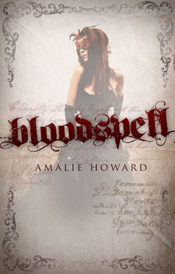 What I loved most of all was how Bloodspell takes everything that you know about witches and vampires, and blends it perfectly with brand new content. Lovers of both of these paranormal creatures will appreciate how Howard sticks to what we already know, and just adds in more fantastic back story for you to fall in love with. The blood that burns in Victoria's veins is well, rather vicious! Her powers have the potential to be dark and terrifying, or of course to be used for good. Add in the fact that her and Christian are not even supposed to be friends, much less more, and you have a recipe for a book that will keep you reading no matter what else you are supposed to be doing. Don't start this book if you need to be somewhere, or eat, or really anything else. The action and fight scenes in this story are descriptive, and I liked how the violence that occurs with these two sets of paranormal creatures wasn't masked over. There is bloodlust. There is violence. Scenes happen where people die and their blood spills upon the Earth. It's not overly gory, but it's there. To me it was an essential part of the story to show that, no matter how composed they look on the outside, Victoria and Christian are constantly fighting that inner demon that is wanting to get out. A delicious combination of older mythology, new powers, forbidden romance, and so much more, Bloodspell is a book that I cannot wait to read again. Luckily this is the first in a series. I cannot wait to see more from Amalie Howard and her vivid characters. Seriously, this has the highest seal of approval that little old me can give a book. LOVE! Go grab a copy and dive in. Let the darkness consume you.